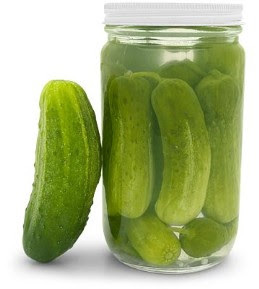 Tiss the season to put down some gerkin cucumber, some baby zucchini or peppers into a brine that will eventually become the fairly familiar 'pickle.' The word is not only a noun in the professional kitchen, it's more of a verb in most senses. We are likely to pickle things like ramps, cippollinis, strawberries or even salmon or brisket, which would also be known as corned beef. While there alot of spices that work well in pickling, cloves, cinnamon, corriander and dill are the most favorite ones, and they are added to a very well described ratio of one to one to one: water, vinager, sugar. Some things I prefer to blanch before pickling, like garlic, onions, califlower, other can be hurried along while being added to a warm pickling liquid like onions, carrots, peppers. On the other hand, things like meat, fruits, tomatoes, and mushrooms need a chilled liquid pickle to survive in peak condition. In any case, I suggest you mix up a pickle liquid, go directly to your closest farmers market, purchases something that won't be available in 6 weeks, and pickle them. You will thank me down the road. Would you put up your pickling liquid recipe? Or is it a secret? I have just gotten into pickling and I am loving kimchi.